In the first part of this series we looked at general multi-threading and multi-core programming concepts without getting into the meat of any real problems. Tutorials on how to spin up worker threads in C(++) using POSIX/Pthreads, Windows or Boost.Thread are a dime a dozen so I won’t spend too much time on that here; instead I’ll look at a much less-documented and more complicated real-world multi-threading problem, namely that of parallel aggregation, and how to implement it both using new C++11 standard library functions, and with Boost.Thread for those who don’t have access to C++11 at present. 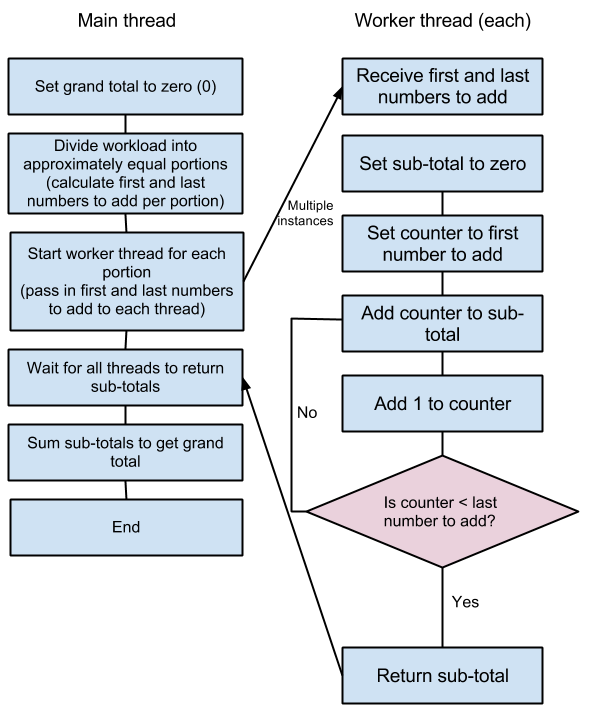 In the example developed in this article, we shall learn how to add all of the numbers from 0 to 1,000,000,000 (1 US billion) exclusive, using multi-threading on a multi-core system to speed up execution and make all the available cores work for us, rather than just one. The last requirement is a reformulation of the first one: if the threads keep stalling to wait for each other, they are not fully independent, and the speed gain may not be worth it for the added complexity. Generally, any process that you split into parts must be somewhat re-engineered to work in parallel. The way to do this is highly algorithm-dependent. Here I have gone for a classic problem of adding a large sequence of numbers, but you can easily re-purpose this to perform any arithmetical operation on any disparate sets of data where partial results can be combined. 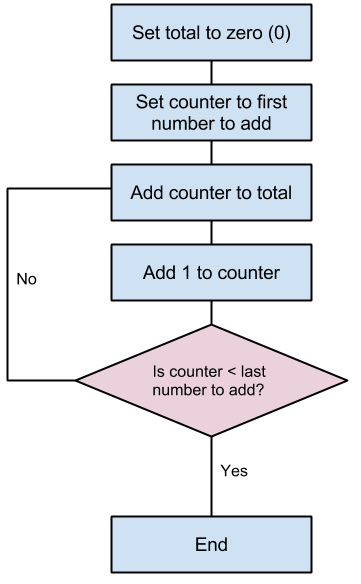 Figure 1 shows the classic approach to adding a sequence of numbers in a single-threaded application. It is essentially nothing more than a simple for loop with a variable storing the running total so far. When the for loop completes, the running total becomes the final total, which is the answer to the calculation. Figure 2 shows how we might split this up across multiple threads. We apportion a block of numbers to add together to each thread. The threads run in parallel and return their own sub-totals. The main thread then adds these sub-totals to get the grand total. Notice that this actually requires more additions than the single-threaded approach (specifically, the sub-totals must be added at the end, so if it is split across 4 threads, there will be 3 more additions), but these additions are a tiny fraction of the total work and do not translate into any meaningful performance hit. Change the build configuration to Release if using Visual Studio – this turns on various compiler optimizations and turns off various debugging bottlenecks and other choke points. Target the correct processor architecture! If you are building for 32-bit platforms, the default Win32 target will be sufficient. If, however, you are building for 64-bit platforms, you should add a 64-bit target in Configuration Manager as shown in figure 3. From the Visual Studio main menu, simply choose Build -> Configuration Manager, then click the Active solution platform drop-down, choose New… and select x64 from the platform drop-down. You should see something similar to that in figure 3. Click OK and close the Configuration Manager, then you are good to go. First of all, it’s important to have some known correct answers to your algorithm or other test cases if at all possible, so that you can compare the results of any aggregated version to a single-threaded known working version. There is no question that the code above will work correctly – the only minor concern being that result‘s value type is wide enough (in bits) to store the total (the correct answer, by the way, is 499,999,999,500,000,000). Secondly, we can find out how long the single-threaded version takes to execute, which is also very important as we will want to see if our multi-threaded version brings useful performance benefits or not – a poor implementation may be even slower than the single-threaded version! As we may be working with milliseconds or even microseconds in extreme cases, we are going to need an accurate clock. C++11 introduces the chrono library which provides the high_resolution_clock static object which can be used to mark time and calculate the difference between two time points. The call to now() returns a time_point object. When the two time points are subtracted – returning a duration object – the method count() converts it to a double. Since we used the high resolution clock, the duration will be an amount of time elapsed in ticks; the number of ticks per second is architecture-dependent, but the conversion from ticks to seconds can be done by multiplying the tick count by the fraction period::num / period::den. Hence, the calculation above takes the time a long task started and ended, and works out from those figures how long it took. Applying this code to the single-threaded example above, the summation takes on average 0.22 seconds to complete on my Core i7-2600K with 6GB of DDR-1600 RAM when built in Release mode and targeting x64 as the architecture. Note that time_duration has a number of methods to allow you to fetch the number of seconds, milliseconds, microseconds used etc. as a remainder fraction or total, but sending it to the console will automatically convert it into a nice human-readable string. NOTE: Boost also includes the Boost.Chrono library which was implemented in the C++11 standard library and has identical syntax to the C++11 example above; simply replace std with boost. Boost users: Replace #include <thread> with #include <boost/thread.hpp> and all references to std::thread with boost::thread to make the code work identically to the C++11 example above. Creating a thread is very simple: you simply create an instance of std::thread, passing in the name of the function to call and an arbitrary length list of arguments to pass to it. Execution begins in the worker thread as soon as it has been created, from the start of the named function. Waiting for a thread to terminate is similarly trivial in this case: you just call join() on the std::thread object. This brings the average execution time back down to around 0.26 seconds on my machine – the extra time is accounted for by creating and deleting the worker thread, which are expensive operations. Note that this is a really classic and important example of how easily things can go awry even when a simple function seems perfectly innocent. Always work through your code step by step in this way when moving data algorithms from a single-threaded to multi-threaded model, and profile its speed at each step to make sure you are still getting the performance you expect. Now we come to the meat of the problem: the implementation of the process shown in figure 2 above. As in the single worker thread example above, we are careful to use a local variable to store the sub-total and only write it to the de-referenced pointer at the end, for performance reasons. Boost users: Replace std::thread with boost::thread to make the code work identically to the C++11 example above. The join() method blocks and relinquishes control to the operating system while the main application thread is sleeping, so the machine doesn’t stall. When a worker thread finishes, join() returns. Therefore, this loop will only exit once all of the threads have terminated. There are various other ways of doing this if you prefer. You can instead use ptr_vectors if you wish to avoid doing the memory management yourself. The benefit of using just 2 worker threads in the example above is immediately apparent: on the same benchmark machine as before, the average computation time is now reduced to 0.17 seconds vs 0.26 seconds in the version with one worker thread. There is a crucial problem with our crude work-apportioning division formula above. It works fine when the number of threads is exactly divisible into the problem size (number of additions in this case); 1 billion is neatly divisible by 2, 4 or 8 threads; but what if you want 7 threads, or 54 threads? What if you want to sum a different series than 0-1 billion? The if statement checks whether the total amount of work (additions) remaining to be apportioned is more than that which would normally be apportioned to one thread, but less than what would be apportioned to two threads, meaning that this will be the final thread to create but there are also some left-over calculations to be done. If so, the number of additions to perform on this final thread is changed from the standard amount to whatever is remaining, by subtracting the current addition start value from the total number of additions in the entire calculation. In our 7-thread example, start_val at this point will be 857,142,852. The amount of work to assign per thread is 142,857,142 additions. If we add these together (start_val and sums_per_thread), we get 999,999,994, meaning that we are about to create the final thread, but the standard amount of work isn’t enough to finish the summation. So, we re-calculate the amount of work to apportion to the final thread as 1,000,000,000 – 857,142,852 which is 142,857,148 – providing exactly the extra 6 additions we need to finish the summation. Notice the thread creation line now uses sums_to_do and not sums_per_thread when passing in the number of additions to do to the thread function. The test at the end of the loop with the break statement is necessary to cause the loop to exit when the first non-standard work unit size is apportioned; remember that if we allowed the loop to repeat once more, start_val would be 999,999,994 and another thread would be incorrectly created, so we avoid that situation by breaking out of the loop once the remaining work has been lumped onto the last thread. The assert macro triggers an exception (or the debugger) if its argument evaluates to false. In our example, if you now change threads_to_use to 7, you should find that the macro is not triggered because the result is correct, but if you try it with the original version of the main for loop, the result will be wrong and an assertion failure will occur (an application crash with a dialog box showing the assert expression which failed). It’s often useful to see when threads start and end, what data is being passed in, what the partial results are and how long a thread took to complete its work. You can simply output text to cout or a file stream, but as discussed in the first part of this series, stream operations in C++ are not atomic so you must wrap their use in a synchronization object. Boost users: Replace std::chrono with boost::chrono (or use boost::posix_time as described earlier) and std::this_thread::get_id() with boost::this_thread::get_id() to make the code work identically to the C++11 example above. As you can see, you can get the current thread ID with std::this_thread::get_id(). A thread ID is a unique system-wide identifier for each thread running (or suspended) on the system. Notice that all uses of std::cout must be wrapped in mutex locks as provided by the lock() method of std::mutex (or boost::mutex). Locking the mutex in one thread will cause all of the other starting threads to stall until it is released, as they wait to write to the stream; similarly the stream write at the end of the function will stall all the other worker threads from exiting or starting. Notice that the 1-thread version calculates the entire correct result on its own; the 7-thread version assigns 6 extra additions to the last-created thread (ID 12132 in this example), and the 2 and 7-thread versions have thread execution which overlaps in time; while some threads have taken 0.07 seconds and others 0.05 or 0.04, the total time was only 0.116 seconds for 7 threads. For clarity, here is the full source code so far. I have added a #define to enable or disable console output (tracing). Comment this out to disable tracing. Multi-core processors provide true hardware multi-threading or hardware concurrency, which means that rather than the threads being time-sliced by the OS, they are truly run in parallel, simultaneously. This gives any well-designed multi-threaded applications you create a massive performance boost, as without multi-threading your application will only use one available core by default. As a rough rule of thumb, the OS does a 1-to-1 mapping of your application threads to cores; that is to say, if you use 4 threads and there are 4 cores available, one thread will run on each core. If all the cores are in use, the OS will generally schedule new threads on the current least busiest cores (the ones under the least CPU load). A normal Windows machine will typically have anything from dozens to hundreds of threads running simultaneously even when the machine is idling on the desktop (you can see this in the Performance tab of Task Manager – right now the Windows 7 64-bit machine I am typing on has 1456 running threads, with many applications running (92 processes)). So, your threads will still get time-sliced, but generally speaking, on an N-core processor, they will be woken up N times more often than on a single-core processor. Note that the OS may reserve 1 or more cores for its own use, so the optimum number of threads to use isn’t necessarily the total number of CPU cores available. In the first part of this series I mentioned Amdahl’s Law, which demonstrates that splitting your task into more threads or cores has a gradually diminishing return; there comes a point where performance plateaus no matter how many extra threads you use, and using more becomes pointless. See the link at the top of this article for more details. To find out programmatically how many processor cores the CPU your application is running on has, you can use std::thread::hardware_concurrency() (or boost::thread::hardware_concurrency()). Note this is the number of logical cores as seen by the OS; 4-core processors such as the Core i7 benchmark machine which also have hyper-threading enabled will self-report as 8-core processors (this isn’t really a problem, just something worth knowing). As you can see performance increases somewhat logarithmically until we get to 7 cores, but with 8 cores in use performance drops off. This is because the OS reserves 1 core for its own use. Results are similar with 2 and 4-core CPUs, so we can conclude that for maximum performance the best number of cores to use is the number available minus one, but if you want to trade off a slight amount of performance, the best number of cores to use is about half that of the number available. In figure 4 you can see the difference between running a 32-bit build on a 64-bit Windows, vs a native 64-bit build, with both Debug and Release build configurations in Visual Studio. All of the results use the Core i7-2600K benchmark machine. The chart was built by running the example in each configuration and plotting the results on a chart using Excel. As you can see, there is a point of diminishing returns by adding more cores, and apart from the 32-bit debug build the performance tops off at 7 cores in all cases. Performance between Release builds in 32-bit and 64-bit are roughly comparable when several cores are in use, but performance of the 1 and 2-core cases suffers dramatically when run on the 64-bit OS. Download the 32-bit and 64-bit versions of the example application. In the final part of this series, we shall look at how to accomplish the same task using PPL, the Parallel Patterns Library for C++11, and the pros and cons of using it. Funny how the 64-bit version is quite a bit faster. I get that with regular apps as well it seems. I wonder what the deal is with the core being taken by the OS. You’d say the OS itself uses threads too (and a lot of them) so it would try to mix in with the rest of the applications to make efficient use of all cores. Perhaps one is chockful of dealing with interrupts? 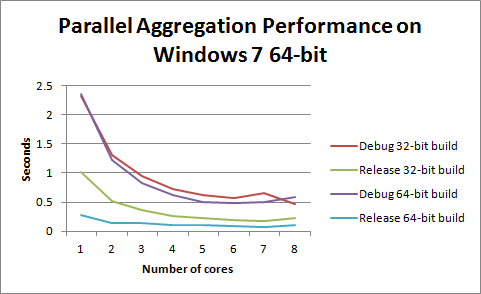 I don’t know exactly how the use of cores is distributed in Windows, but from the graph of results it seems clear that using more than N-1 cores negatively impacts the application’s performance, so something murky must be going on! Aha, good call, I forgot about std::accumulate. Thanks! Thank you a lot for this really great article! While a lot of resources point to C posix threads, boost and C++11 lambdas and futures, I found this the most useful article for my problem!! Thanks again!